All Aboard! All Aboard! Thomas the Train has pulled into his new station: Eduardo's renovated room! Eduardo is an adorable six-year old little boy with endless energy! He was diagnosed with Autism in August 2010 and he was also diagnosed with Attention Deficit Hyperactivity Disorder-Combined type in October 2011, both neuro-behavioral disorders. hanks to the unconditional love and endless devotion from his Mom and Dad, Eduardo began receiving intensive in-home behavior intervention services even before he was formerly diagnosed. Eddie is a happy child but he faces many challenges. 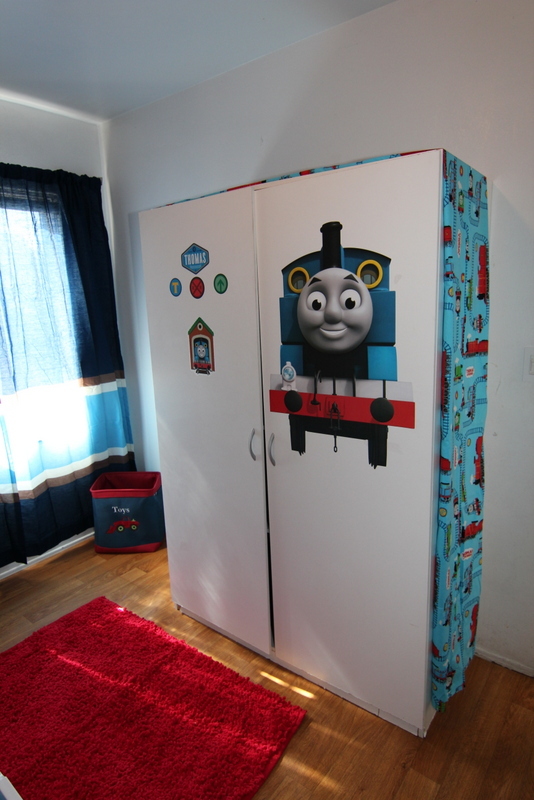 He engages in stereotypical behaviors associated with Autism, such as excessive spinning, lining up/stacking items, obsessive-compulsive behavior tendencies, maladaptive behaviors, and often isolates himself from others. The team at Cecily's Closet wanted to provide Eddie with a special room that would fulfill his need for sensory stimulation by providing a bright, fun engaging space - as well as a great place for him to retreat to when he needed time for himself. Our dedicated volunteers found fun wall art to inspire his imagination and a soft shag rug to provide various textures to help calm Eddie and fulfill his need for input. 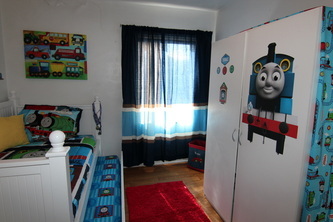 The room was designed around Eddie's passion for Thomas the Train. We're hoping that his new, decorative room will provide him with his own space for him to have fun and play - as well as complete his ABA sessions and homework without outside distractions. Cecily's Closet left a few personal touches behind for Mom, Dad and his new baby sister, too. Thank you to our team of volunteers who made Eddie's Sweet Dream Room Makeover come true! A special thanks to Blake's Haul Away for helping us clean up the family's yard and to some new volunteers that came and helped tend to the family's gardening needs! Thank you to Mattress Company Direct for the beautiful furniture you provided and set-up perfectly! 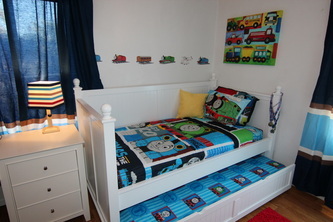 We're proud to announce that with the completion of Eddie's room, we've just completed our 45th room makeover! Thank you to our donors and supporters for your dedication, passion and commitment. 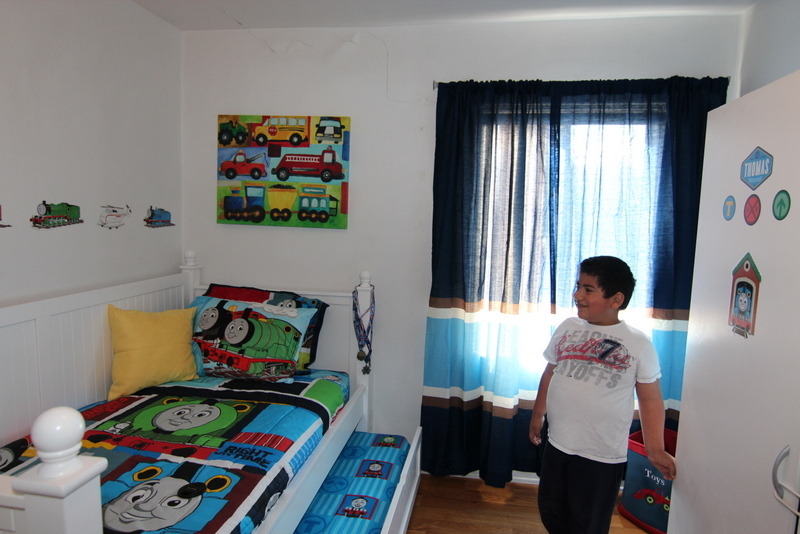 Without your support, we'd never be able to help deserving families like Eddie's.